MUNICH, Germany -- The head of the international group overseeing the cease-fire deal in eastern Ukraine said the situation in the region is at its worst point since last September's lull in fighting, and warned it may take months for Ukraine to hold local elections in the east. "Now it's really a low" point, Lamberto Zannier, the Secretary-General of the Organization for Security and Cooperation in Europe said during an interview in Munich on Sunday. "I would say it's the worst since September 1, what we are seeing now." Foreign ministers from the so-called Normandy group--Russia, Ukraine, France and Germany--met in Munich for 45 minutes on Saturday morning to discuss the situation. The Minsk deal required Ukraine to amend its constitution to hand greater autonomy to its eastern provinces and demanded the end of violence from pro-Russian separatists. It also committed Moscow to return control to Kiev of its side of their common border. The agreement was supposed to be sealed by end-2015. Local elections were also due to be held across the country, including in rebel-held Donetsk and Luhansk last year under Ukrainian law. However only a few of the Minsk pledges have been fully completed. Elections in the east still haven't occurred. 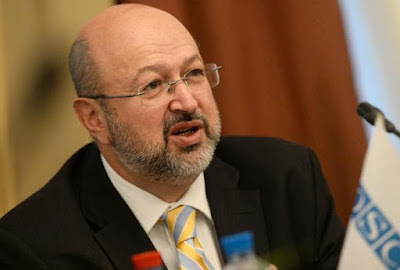 Mr. Zannier said that in recent weeks, with the political talks between Kiev and Moscow blocked, there have been a number of worrying developments on the ground. He said there have been "systematic violations" of the cease-fire, with both sides redeploying heavy weapons that had been withdrawn in line with the Minsk deal. He said pro-Russian separatists have significantly tightened access in the east to OSCE monitors and stopped them from traveling at all to the Russian controlled border--which has been the crossing point for weapons, kit and fighters over the last two years. He also pointed to "circumstantial evidence" that equipment is again flowing over the Ukrainian border from Russia, although his monitors haven't been able to verify that as they have been aggressively and repeatedly blocked from visiting rebel-held territory around the borders, he said. "Now we are being pushed back every time which raises suspicion that something is going on," he said. "Why are they blocking us so systematically? But of course we cannot... report on anything specific because we are not there." In recent days, other western officials have also warned of deteriorating conditions in eastern Ukraine. "The line of contact has been anything but a peaceful place," Gen. Philip Breedlove, the top commander of the North Atlantic Treaty Organization said in Munich on Saturday. "It is clear that as Russia is unhappy with Kiev's progress toward Minsk they will dial up or down the pressure along the LOC [line of contact] in order to affect their way forward." The European Union and the U.S. have tried broad economic sanctions to the complete implementation of the Minsk deal. On Saturday, German Foreign Minister Frank-Walter Steinmeier warned that while the intensity of fighting in eastern Ukraine was lower, "we are still a good way away from implementing Minsk." He added: "I expect that in Kiev and Moscow, everyone responsible understands that we no longer have unlimited time for implementing that which was agreed in Minsk." Mr. Steinmeier said France and Germany wanted to see progress on several key issues in time for the next ministerial meeting of the Normandy group, likely in early March, according to diplomats. These include entrenching the cease-fire and ensuring the local elections take place in the east under Ukrainian law and with enough security available to ensure the ballots are free and fair. Rebel leaders threatened to hold local elections of their own last fall but agreed to delay them. Kiev still has to pass the necessary legislation to hold the elections and Russia, Ukraine and the rebels are at loggerheads over which displaced people should be entitled to vote, the role of Ukraine's electoral commission and security. Mr. Zannier said the local elections could be a "gamechanger," making it easier for Ukraine to work with separatist leaders in future while securing a place for the Russian-backed rebels in Ukraine's political process and ensuring the region remains subject to Ukrainian law. However, he said it would take some time for the OSCE to organize and run elections even if all the issues around the format for the election are resolved. Asked what would be a realistic time frame for the ballots, Mr. Zannier said " summer or after the summer." "We need to have a clear understanding of who is the guarantor--who is providing a security framework for our observers. Because we can't just throw them in." While Western governments have blamed Russia for spurring the conflict with Ukraine and have placed broad economic and other sanctions on Moscow for its involvement, there has been growing frustration with Kiev's failure to implement its part of the Minsk deal. "Ukraine has responsibilities with respect to Minsk and it's critical that it upholds its end of the bargain," U.S. Secretary of State John Kerry said on Saturday. The Ukrainian government has faced growing opposition to its agenda in parliament in recent months while tensions within the governing coalition have flared. Alexander Grushko, Russia's ambassador to NATO, said the crux of the problem in Ukraine was Kiev's failure to implement the Minsk accords and implement autonomous status for eastern Ukraine. "Violations are growing and shooting is occurring on both sides," Grushko said. "We do our best to make the cease-fire more sustainable."